Authors, Kai Strand & LA Dragoni: Gretchen Maurer presents Mary Tudor "Bloody Mary"
Today we welcome Gretchen Maurer, author of Mary Tudor “Bloody Mary”. About the book: The first reigning Queen of England, Mary Tudor believed fervently that Catholicism should be the religion of the land, leading her to burn at the stake hundreds of Protestants. Was she just a ruler of her times, or did she deserve the name, Bloody Mary? Gorgeous illustrations and an intelligent, evocative story bring to life a real dastardly dame who, fueled by her faith, created a religious firestorm. I talked with Gretchen about her book and her inspiration behind it. Kai: What age range is Mary Tudor “Bloody Mary” for? Kai: Can you share a memory of yours or a story from when you were that age? Gretchen: I raised turkeys for 4-H, and I once won the “3rd Fastest Turkey” award. We put bibs on the turkeys with the sponsor’s name on them, and my turkey kept stepping on his bib. He actually got third place by running backwards and in circles. I remember laughing so hard, watching that. Kai: That’s so funny! Too bad you don’t have that on video, you might win America’s Funniest Videos. Gretchen, how has life changed for children today than when you were that age? Gretchen: Today kids use computers, the internet, and cell phones—I grew up with none of those things—and watching a movie today is easy and no big deal. When I was a child, you could only see a movie in the theater or occasionally on T.V., so for me watching a movie was a big, big deal. I still remember the patent leather red purse, red dress, and black Mary Janes I wore to the theater to see Bambi. Gretchen: My kids (8, 11, & 14) have fun in many of the same ways I did: creating crazy recipes or shows, riding bikes, playing catch or badminton, drawing, watching T.V, playing with our dog, making forts, reading, making up songs and listening to music, hanging out with friends … and they also have to do jobs around the house, like I did as I kid. They argue and scuffle like my siblings and I did, too. Kai: What inspired Mary Tudor “Bloody Mary” and how did you decide on this age range for your book? Gretchen: I was fortunate to be selected by the publisher of Goosebottom Books to write this book. 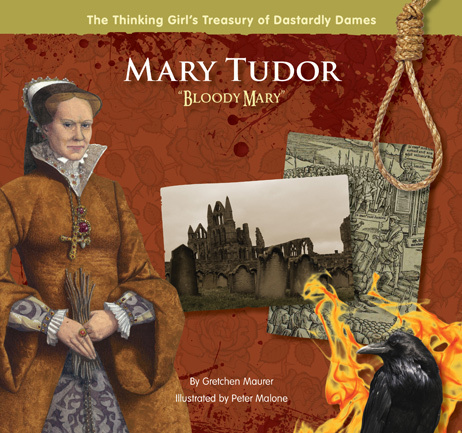 She chose the target age range (9-13), and I was pleased to be assigned to write about my first choice (Mary Tudor) out of the 6 dames she planned to feature in her series, The Thinking Girl’s Treasury of Dastardly Dames. I chose Mary Tudor, the first reigning queen of England, because to me her nickname, “Bloody Mary”, was the most brutal-sounding out of the 6, and I wanted to learn more about why and how she earned it, and whether or not she deserved it. I wanted to find out if she did anything good, too, and to learn more about her childhood and who she was as a person. I dug into my research and wrote a boiled down version of all the fascinating stuff I learned, which, once edited and put into book form, became Mary Tudor “Bloody Mary”. It’s definitely a book that makes you think. I believe it’s important for girls to read books about powerful women in history, books that really flesh out their lives and explore the social/political times in which they lived. A lot of children’s books have been published about influential men in history, but not as many about women. Kai: Finally, I have four kids. Over the years, they’ve attended a lot of birthday parties. I love the idea of building a theme gift around a book. If you were to give a gift basket to a child based on your book, what else would be in the basket besides Mary Tudor “Bloody Mary”? Gretchen: I might include a piece of jewelry and some candy. I’d include a ring or necklace because Mary Tudor loved jewelry and clothes, even though she’s most often portrayed as looking stern and dowdy. (An interesting, jewelry-related fact: Mary wore a drop-pearl necklace that, after her death, was worn by European rulers for centuries, until Elizabeth Taylor owned and wore it in the 1960s.) I’d include some candy in the basket, because Mary’s favorite candy, Manus Christi, was made out of rosewater, powdered pearls, white sugar, and was decorated with gold, and I think that’s interesting. If I wanted to go all out, I might also include a few other books from The Thinking Girl’s Treasury of Dastardly Dames. Kai: I love to hear details like that about famous (or infamous) people. The fact that she liked candy reminds us that she was just a person like the rest of us. Thanks for joining us today, Gretchen, and for talking about you book. I enjoyed meeting Gretchen Maurer in mid October at their book launch in Ukiah at the Mendocino Publishing Company. I was even more delighted to win a copy of Gretchen's Mary Tudor book during the raffle, as part of a benefit for the Ukiah Public Library. Thanks again, Gretchen! I'm now half-way to owning the complete six books of the Dastardly Dames series. What a unique look at history! Will be donating the autographed set to the Washington School Library. It is a pleasure to host Gretchen on the blog. Robin, thanks for sharing your story. That is so great of you to collect the series for the library.